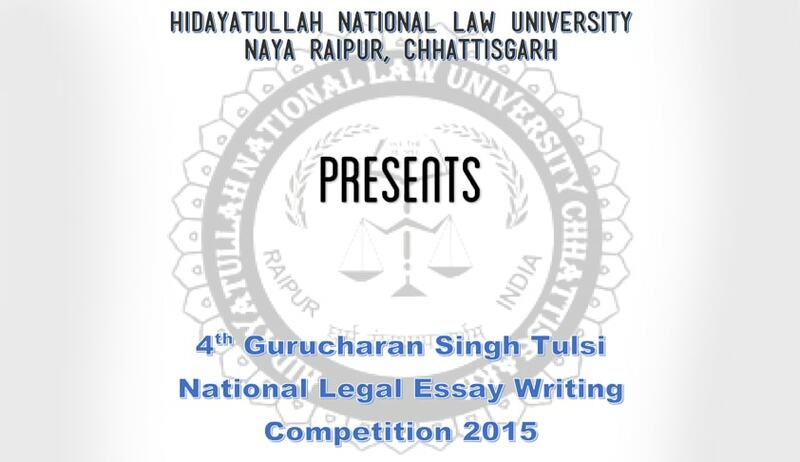 The Legal and Social Services Committee (LSSC) of Hidayatullah National Law University is going to organize the “4th Gurucharan Singh Tulsi National Legal Essay Writing Competition, 2015” in the name of reverent father of Mr. K.T.S Tulsi, the renowned senior advocate of Supreme court of India. Eligibility: Students pursuing LL.B. (Hons.) / LL.B. / LL.M. course from any recognized university can participate. Submissions should be in MS Word-2013/2007 format along with the PDF format of the same. The essay must be preceded by an Abstract not exceeding 300-350 word (in single MS Word Document). The submission must contain a covering letter containing details of the participant such as Name, Date of Birth, Permanent/Residential Address, Telephone Number, Email, Name and Address of College/University, Course and Academic Year (separate file from the essay document). Authorship to the maximum of two is allowed. However, only one entry is allowed per student. Certificate of appreciation shall be awarded only to the top TWENTY entries of the competition.